Leather leash adds that extra touch to your walk. 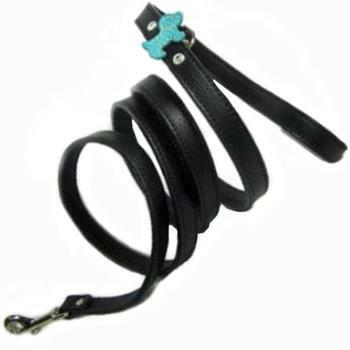 Simply select the leather color for the leash and the dog. Add the Swarovski crystals to place on both sides of the dog and you are ready to go. Each leash is leather on both sides with hand-painted edges as is the dog. The hook size varies according to the width of the leash.The nickel D-ring is attached near the leather handle to attach a coordinating poop bag holder. It is such a nice match with the Malka collar.